Zoren-Carmina nuptials is definitely one of my favorite weddings of all time. I almost cried watching their TV Special last weekend. It’s so grand, touching and lovely. Makes me wanna have a beautiful wedding like that too! Carmina was told they’ll be in a “family product photoshoot” at the Fernbrook Gardens, little did she know that she’s going to get married that same day! 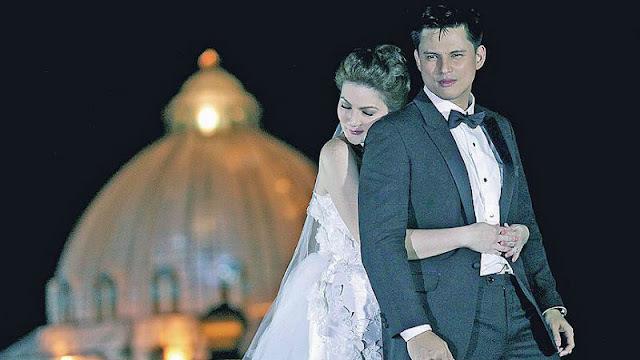 The moment Zoren appeared in his dashing tuxedo and proposed to Carmina with a diamond ring under a man-made Cherry Blossom tree, everyone watching had their hearts melt together. They’re so perfect together! That look on her face – half surprised, half teary and half confused – is priceless! You woman! You’re very very lucky! What a handsome groom you have. I truly have nothing else but good words to say to Zoren right now. It’s amazing how he had everything planned out perfectly and how he had the courage to show the world how great his love is for her.